Wheat allergy is most common in children, and is usually outgrown before reaching adulthood, often by age three. Symptoms of a wheat allergy reaction can range from mild, such as hives, to severe, such as anaphylaxis. Therefore it is advised that people with wheat allergy have quick access to an epinephrine auto-injector (such as an EpiPen®, Auvi-Q® or Twinject®) at all times. 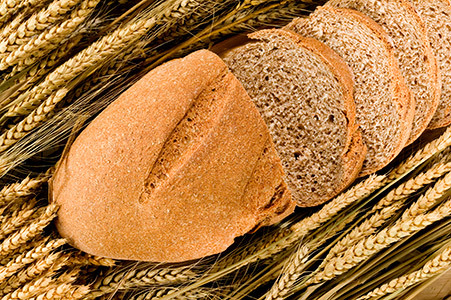 To prevent a reaction, strict avoidance of wheat and wheat products is essential. Always read ingredient labels to identify wheat ingredients. Avoiding Wheat The federal Food Allergen Labeling and Consumer Protection Act (FALCPA) requires that all packaged food products sold in the U.S. that contains wheat as an ingredient must list the word “Wheat” on the label. Wheat is sometimes found in the following: • Glucose syrup • Surimi • Soy sauce • Starch (gelatinized starch, modified starch, modified food starch, vegetable starch) Some Unexpected Sources of Wheat* • Read ingredient labels carefully, even if you would not expect the product to contain wheat. Wheat has been found in some brands of ice cream, marinara sauce, play dough, potato chips, rice cakes, turkey patties and hot dogs. • Wheat also may be found in ale, baking mixes, baked products, batter-fried foods, beer, breaded foods, breakfast cereals, candy, crackers, processed meats, salad dressings, sauces, soups, soy sauce, and surimi. • Some types of imitation crabmeat contain wheat. Keep the following in mind: • Many country-style wreaths are decorated with wheat products. • Wheat flour is sometimes flavored and shaped to look like beef, pork, and shrimp, especially in Asian dishes.